These smoky, fragrant lamb bites, served alongside a coarsely chopped, rustic vegetable salad with charred tortillas for wrapping into tacos, are the best kind of outdoor food. A complete grilled supper, easy enough for a weeknight, but elegant enough for company on the weekend. Pour plenty of cold beer or sangria and make it a fiesta! While the lamb marinates, stir together the sauce ingredients and set aside, adding salt and pepper to taste. In a bowl, using your hands, toss the sugar snap peas and red onion wedges with 2 tablespoons olive oil, then rub the remaining oil from your hands over the shucked corn. Season the peas, onions and corn with salt and pepper to taste. Set aside. When ready to cook, light a charcoal grill and prepare the grates for grilling. Thread the lamb, shallots, and tomatoes onto the skewers while the grill heats: 12 pieces of meat, 3 shallots, and 3 tomatoes per skewer. Bring the meat and vegetables out to the grill, also the tortillas, a tea towel, and a clean platter to hold the lamb. When the grill is hot and ready to cook, use a grill basket (or cooling rack on the grates) to char the snap peas and red onion. Place the corn on the grill and cook, rolling to lightly char all sides. Remove the vegetables from the grill as they are cooked and place them back into their bowl. Place the lamb skewers on a hot part of the grill and cook, turning occasionally, until charred and done to your liking (because the cubes are so small, this should only take 5–6 to 10-12 minutes total for medium rare). Remove the skewers from the grill and place on the clean platter to rest. Lay the tortillas around the grill and char on both sides in two batches of 6. Remove them from the grill into the waiting tea towel and wrap to keep warm. In the kitchen, while the lamb rests, cut the corn off the cob back into the bowl and roughly chop the onion. If you like, slice the snap peas on the bias, or just keep them whole. Toss the vegetables together with the cilantro, lime juice, a good glug of olive oil, and salt and pepper to taste. 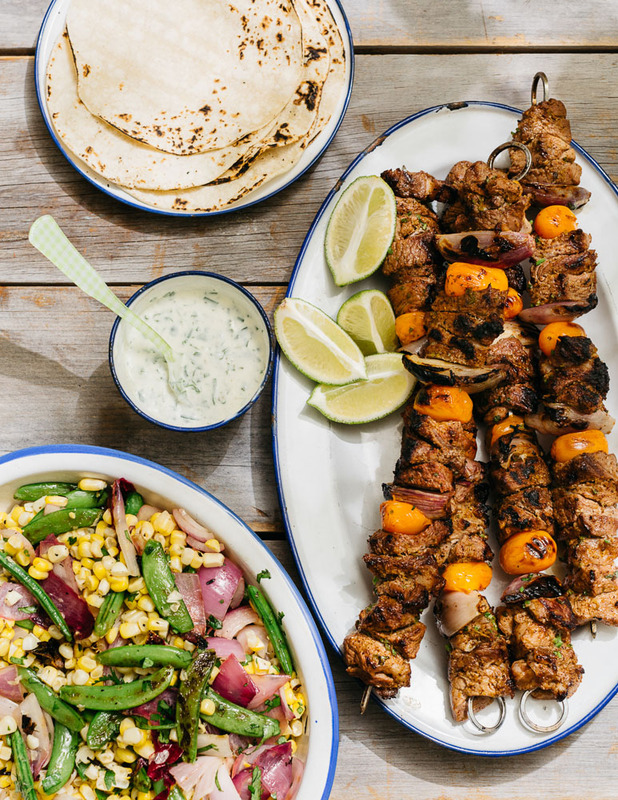 Serve each person a lamb skewer drizzled with the crèma sauce, some corn and pea salad, 3 tortillas, and a lime wedge, with hot sauce at the table.